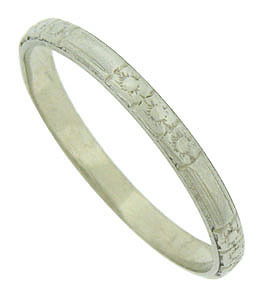 A pattern of engraved posies peeks out between the smooth polished surface of this vintage wedding band. The Retro Modern wedding ring is fashioned of 14K white gold and measures 2.05 mm in width. Circa: 1940. Size 6. We cannot re-size.